In my mind’s eye, I’d imagined welcoming the First Family’s former nutrition guru to New York City with a gracious, high-calorie luncheon in one of Manhattan’s white-tablecloth restaurants, followed, possibly, by a stroll through the Greenmarket to inspect the morning’s crop of duck eggs. 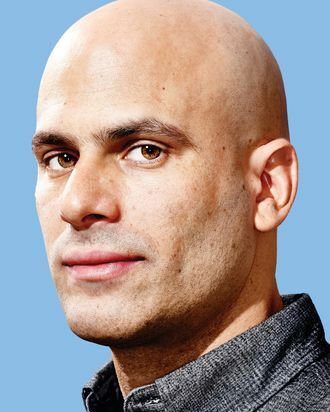 But Sam Kass, who’s just moved to town after six eventful years in the White House as, among other things, the Obamas’ gardener, craft brewer, and private chef, has suggested, in his ebullient, persuasive way, that we visit one of his favorite new neighborhood enterprises, the online farmers’-market delivery service called Good Eggs. Which is how we find ourselves out among the truck depots of rain-drenched Bushwick, rummaging around in a giant fridge filled with bags of rainbow carrots and just-picked rutabagas. “Look at the stems—they’re freshly broken, which means they’ve just been picked today,” says Kass, waving a plastic container filled with a “gourmet medley” of lettuces from a rooftop farm in Brooklyn. Kass has been a New Yorker for only a few weeks (he married the MSNBC host Alex Wagner last fall, then quit his government posts at the end of December to move into their Dumbo apartment). Compared with the scruffy, wool-capped warehouse staff, he still exudes a professional Washington, D.C., sheen. His jeans are pressed, his boots polished. Good Eggs opened in Brooklyn a little over a year ago, by way of San Francisco, and thanks to a Series B round of funding, it plans to expand its bespoke farm-to-table delivery service to Manhattan. Kass, who seems to know everyone in the local-food movement, found out about it from his friend Greta Caruso, who is one of the founding partners and used to work with Alice Waters. “I was visiting San Francisco, and here’s my old friend Greta, who’s just done this really cool thing,” he tells me as we move through the warehouse, down rows of shelves stocked with kale chips and chai. We stop to chat with Josh Morgenthau, the grandson of the New Deal architect Henry Morgenthau Jr., who runs the New York operation, then join the employees eating lunch at picnic tables as the wistful, bouncy tones of Panda Bear float through the big room. Kass takes a bite of dal and grins merrily. “Welcome to Brooklyn,” he says. In case you were wondering, Kass’s breakfast this morning was two soft-boiled eggs dabbed with a little hot sauce, a cup of dark-roast Stumptown coffee, and a bowl of granola. He and Wagner usually cook at home, though they are also avid restaurantgoers. One of his Washington duties—which included running the First Lady’s child-health initiative, Let’s Move; serving as the White House’s first-ever policy adviser on nutrition; and cooking the Obamas a healthy family dinner five nights a week—was to suggest where the Obamas might dine in New York. Dan Barber’s farm-to-table establishment Blue Hill was one of his ideas, as was the New York food cognoscenti’s darling of the moment, Estela. A big romaine salad soon arrives at our table, along with a serving of weirdly pale mashed sweet potatoes, delivered by a gentleman whose beard has been dyed on its fringes to the color of automotive antifreeze. Kass describes his new life as “momentarily uncluttered,” and you get the feeling that he’s fine with that. “Now I’m the private chef of Alex Wagner,” he says between mouthfuls. “That’s a high-stress job!” He would like to stay in the realm of whole food and nutrition in the private sector and is in no hurry to get behind the stove; he’s “looking at a few TV opportunities” and planning a trip to Paris as part of a State Department culinary-diplomacy program. The sustainability movement has made great progress, he says, but it has a long way to go, and as more food clatters down onto our table (a gently charred sausage pizza, orecchiette in a rich pig’s-tail ragù), he equates the nutritional challenges facing soda-swilling America to those facing fatso restaurant critics like me.